So, after Lex made his debut, we have all been wondering what he had been up to, it clearly has taken him years of clever planning to put all the pieces in play. We are treated to this and to what has been happening the past few months with the Red Daughter in The House of L. Lex clearly once again showing how manipulative he can be, brilliant and psychotic as his nefarious plans start to unfold. While we don’t see him in All About Eve, we do know he is clearly behind it all now without question. All about Eve was taken from the play of the same name where the named lead uses her mentor for her own gains. Eve clearly has used Lena for her own and Lex's gains since the start. No wonder we see a slightly broken Lena at the start of this practical episode and Lillian gloating over Lex's victory doesn't help matter's but Lena as always proves she is a Luthor rising above it all to fight back. Let's take a closer look at the events in these two episodes. This episode picks up where we left off last week after Supergirl's confrontation of Lex outside the Luthor Mansion. Lex now is in his super suit battling Supergirl after she tried to stop him, but he doesn’t need it seems the Heranel has given him a boost too. As he is about to crush her with the daily plant sphere, we flashback to Lex’s trial. James and Lena testified against Lex. I guess that's why he hates them so much, Lena went so far as wearing a wire to uncover his plans. ‘Superman made me do it’ isn’t the best defense when you try to turn the Earth’s sun red which would kill millions of people. I was surprised it was only 31 consecutive life sentences and obviously 32 when he clearly is responsible for the poisoning of the judge and jurors. This is the maniacal Lex Luthor we have come to know, and love and Jon Cryer’s portrayal pulls it off perfectly. The fact they play I did it my way as chaos erupts in the courthouse was perfect. Lex Luthor's crew comprising of Otis (we will learn more later how he is alive) and Eve Teschmacher, it’s a real nod to the Superman movies of old. Though for someone so smart giving Eve a bit of a Manson complex, loving a killer was disappointing but her antialien views clearly aline with Lex's. In prison, of course, Lex isn’t idle and getting a visit from Eve he slowly puts his plan into play, but she knows she is better than just working at Catco. While we may have been led to believe Lex has been carving out art in his cell six months previous, he got a call from Kaznia about a copy of Supergirl. Yes, Lex manages to get 72 hours pass from prison by threatening the warden’s family. Of course, he still appears to be in prison thanks to a holographic projection. Flashback to the copy of Supergirl arrival to Kaznia, the only words she speaks is Alex. They teach her their language which no surprise she picks up quickly. They also learn she has all Supergirl powers too, which is unfortunate for some of them. This is when they call in Lex however before he arrives, she hears someone in trouble and goes to help. Killing some men who were attacking a young boy, this is where Lex finds her protecting the child. Saying his name is Lex she mistakes him for Alex. He Plans to condition her to his will. All she remembers is the name Alex and he exploits it saying they are friends time is soon upon them, but he will return. He promises to send her books to learn English and like any good teaching techniques he rewards with a treat. Eve has now moved into working with Lena, Lex wants some patsy’s and Otis tells Lex about Ben Lockwood as he starts moving the pieces into play to make him the hero of America rather than the villain. Eve tells the Heranal is probably responsible for the Red Daughter in effect splitting Supergirl. Lex continues to teach Red Daughter chess and the books are all about greed and of course, he portrays America as the enemy not only of Kaznia but all. She still keeps visiting the young boy she saved and takes Lex there. When the kryptonite hits( remember Otis and Mercy graves along with Lockwood released it ) Lex blames the Americans and helps protect her, all the while she is is being shown images on tv screens continuing her conditioning under Lex. There was a nice touch of putting the earrings in while she was weakened so she matches Supergirl. Lex takes Red Daughter to America, her disguise as Linda Lee is a nod to the original Supergirl movie. Of course, he shows her the dark side money greed and power. He takes her to Kara’s apartment we learn Kara is away is Smallville when Alex shows up to water the plants, Red Daughter has a pretty convincing American accent but on reading Supergirl’s journal she becomes very curious about her life and even goes to see Lena as Kara. Eve knows who she really is warning Lex they may have a problem. Lex goes to extremes of killing the child red daughter saved and using an American warship to get her back to his way of thinking. However Red Daughter destroys the ship, so Lex has to clean up her mess killing those onboard who saw her. Melissa Benoist really sells the scene screaming her anguish at the death of the child but don’t worry Otis might be on Lex’s side but clearly killing a child goes against his morals and he has taken the boy away. Lex sabotages the warship to make it look like an accident. Lex loses his temper with her because she went off and destroyed the warship he leaves angry but Lex comes back when Red daughter is ill.
Everything weaves together now we know the Heranel was in fact to save the Red daughter, not Lex. Lex poisons himself with radiation to force Lena’s hand. Eve tries to talk to him saying there is another way, but he doesn’t listen of course. By saving himself with the Heranel he also saves Red Daughter with his blood. He asks Lena for help saying he is dying and of course that takes it up to the previous episode. Back to present day and we have Lex now is in Kaznia solidifying his relationship with Red Daughter, saying she won’t act on her emotions like Supergirl but on orders. She even gets her own suit. Supergirl does a flash like entrance into the hospital to announce to James and Alex Lex is out. Eve leaves a letter from Lex with an unconscious Lena at L Corp.
Once again, the action picks up after it left off with Alex and the DEO busting into L corp to find a still unconscious Lena and a note from Lex on how he tricked her maybe this was to absolve Lena as well as to gloat. Lena apologizes to Alex and is about to say more but Alex tells her to rest she has been through a trauma. As J’onn and Supergirl fly above the city, Supergirl feels she has failed Kal by letting Lex slip through her fingers. J’onn tries to use his psychic powers to track Lex but hears his father and passes out causing Supergirl to save him. We see a very sweet Supergirl and space dad moment where she tells him to look after himself. He states he is going to use the staff to communicate with his father as he feels lost. This takes J’onn out of the action this episode, it’s a welcome return to see Carl Lumbly back as his father as he realizes he is only fighting himself. Some wonderful performances from David Harewood and Carl Lumbly. James is the out the hospital but seems to be jumpy a fact his sister notices, but he ignores it throughout the episode. His sister is a psychologist and recognizes the signs. Ben Lockwood once again trying to repeal the Alien Amnesty act and has the votes he needs but one Senator changes her mind much to his displeasure. Supergirl comes to the DEO bearing gifts, donuts always help and is surprised they are not searching for Lex. 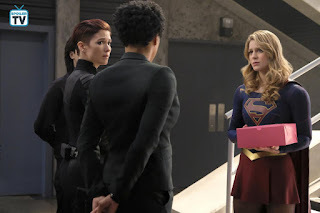 Colonel Haley tasks Alex with helping with the search, but Alex says Supergirl and Lena don’t have the best history she will talk to Lena about Eve as now they know she was working with her. Supergirl returns the Legion ring to Brainy as well. I like the fact Alex now has her own Supergirl pager watch now. Lena meanwhile visits her Mother in prison, and she gloats over Lex’s victory over her. 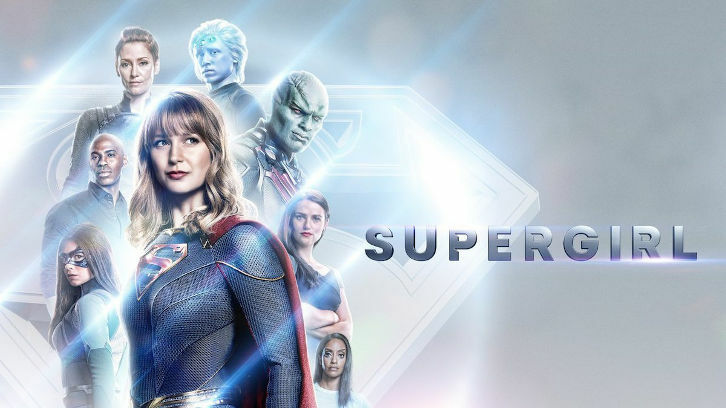 A welcome return for Brenda Strong as Lillian Luthor, Lillian as you may recall follows the same views as Lex. She threatens Lena with the knowledge what if her friends found out about her betrayal. 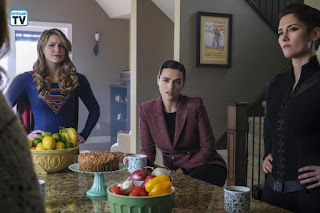 As Lena and Alex work together and trace Eve’s Aunt they call Supergirl and I love the fact these three turn up on the doorstep. A very Charlies Angels moment. Eve’s Aunt isn’t home, but her cousin is, a Cousin Lena was told had terminal cancer. Grabbing a hot pie dish with her bare hands and the fact she is clearly lying reveals Eve used the Heranal on her. We learn Eve has a secret Lab. Meanwhile, Eve and Red daughter seem to be up to no good but as to what we don't find out till later clearly sneaking somewhere. James is still denying anything is wrong and basically, tell's his sister to go as he is ok. He is convinced Manchester Black tried to kill him. In James office, all the big screen tv's are off not to see Lex’s face. Seems Lex has tried to kill him 8 times. James believes he is ok as previous attempts on his life were because of Superman, who we are once again reminded is off world. At the lab, Supergirl finds the Heranal. At first, she is angry with Lena for once again keeping something harmful from her. Supergirl then apologizes and explains why she behaved that way. Lena and she finally make amends after their fight from the previous season. Lena still continues to be sneaky when she finds blueprints for her Mother’s prison. What is she up too? The password I LOVE LEX gives them access to all Eve's research they also find a gun like the one that shot James. We also learn Eve was responsible for reviving Otis by working on the Metallo project, We all remember super strength humans with Kryptonite heart's, Eve had a few attempts but obviously succeed in reviving Otis ,the question is where are the failed ones. This is soon answered when they are attacked by one of course the kryptonite is harmful to Supergirl. I loved the three of them work together to defeat it. These three work so well together future team-ups are needed. As they take the kryptonite heart to the DEO they think Lex may have a connection to Ben Lockwood due to Otis Graves. 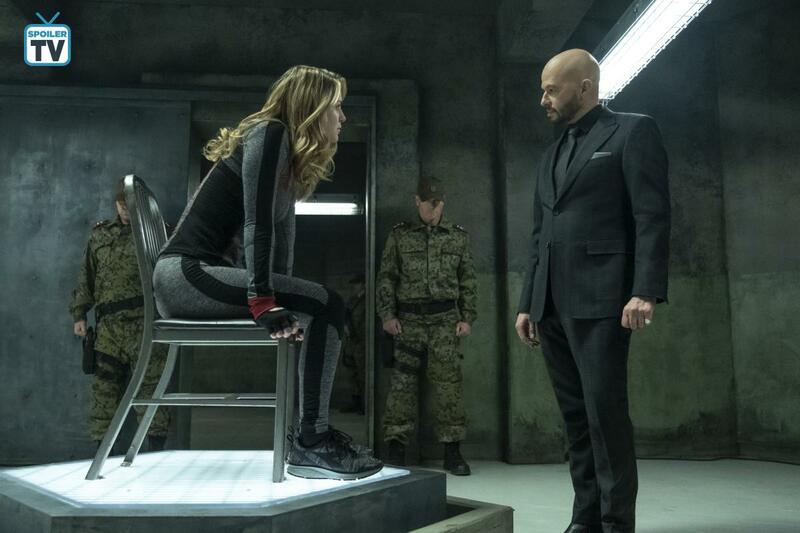 The ballistics on the gun found at the lab prove Eve shot James, there seems no end to Lex’s and Eve’s betrayal as Lena offers to speak to her mother. Kara tells James it was Eve who shot him, so Kara is off to DC to talk to Ben Lockwood about his connection to Lex. The Alien Amnesty act has been repelled and she notices Eve is a hologram of one of the Senators. Lena tells Lillian Lex planned to kill her so she obviously knows something that can be used against him. Lena plays Lillian beautifully and I think Lillian knows Lex will kill her, so Lena is her only hope. As to why the Senator changed her mind and the appeal won that has Eve’s prints all over it along with her managing to set up Supergirl so she is out of commission. Red Daughter attacks the senators posing as Supergirl. James freezes and you can tell he is suffering due to his trauma. You also wonder hasn’t he got any powers from the Heranal. Ben Lockwood is in fear of his life but strangely he is spared, on Lex’s orders no doubt. Supergirl frees herself but too late to stop her doppelganger and now it looks like she was responsible as the President later declares her as public enemy number one. Colonel Haley surprises us when Alex’s says Supergirl wouldn't do that and agrees with her. James goes to his sister for help and I can see this being an interesting storyline into the effects of PTSD. Also seems his sister is going to be around for a while I am interested to see more from this character who has been confirmed as a season five regular. J’onn goes on his quest, oblivious it would seem to what has happened. Kara is feeling all alone until she hears a signal from Alex, Lena and Alex are waiting for her at L corp both wanting to help her prove her innocence. Two brilliant episodes bringing all the storylines together. 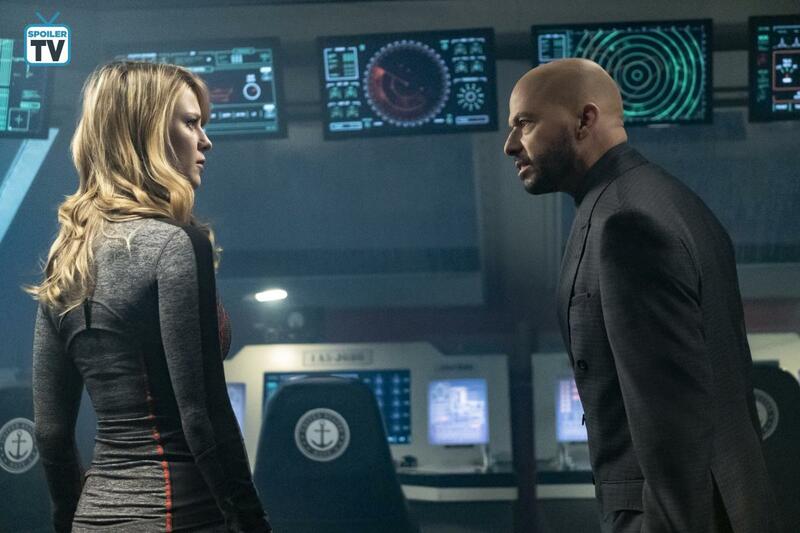 Lex seems to have all the moves while everyone else has nowhere to go and unfortunately now we must wait two weeks to see how this story continues to unfold. Is lex all you hoped he would be? Can Red daughter be saved? Could Lillian be Lex's weak link and the key to his downfall?